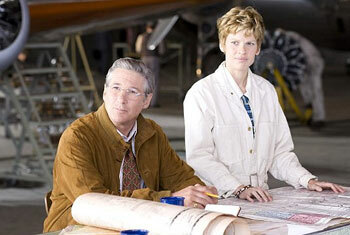 Mira Nair's Amelia was shot at many fabulous locations. She says it was important to the film that it had a sensuous look. 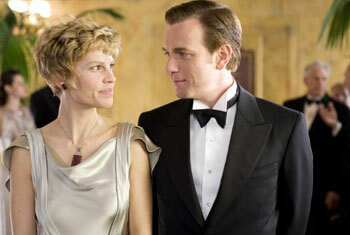 The movie starring the two-time Oscar winner Hilary Swank takes places mostly in the 1930s and 1940s. 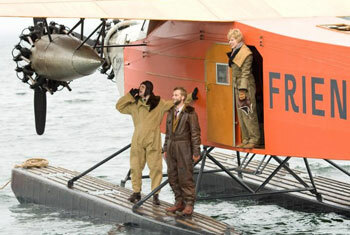 'Amelia was wedded to nature, to the elements, to the skies, to the ocean,' Nair says in the production notes of the film. 'These were the elements she loved and these were the elements that swallowed her so I wanted to use landscape to capture the part of the world she was drawn to the most," says Nair. Nair collaborated closely in creating the film's look with cinematographer Stuart Dryburgh, who garnered an Academy Award nomination for the rustic imagery of Jane Campion's hit film The Piano over 15 years ago. Dryburgh drew inspiration from the extensive documentation that has been amassed of Amelia's life and times screening newsreels and pouring through period photography. Yet one of the first decisions he and Nair made was to keep the film's visual atmosphere fresh and modern. Shot in widescreen anamorphic to emphasize the vastness of Amelia's story, Dryburgh's other primary goal was to capture the raw thrills of solo aviation. To achieve this, Dryburgh put together a crack aerial unit led by 2nd Unit Director Marc Wolff, a veteran helicopter pilot in his own right and a leading expert in aerial photography. 'Marc covered every airplane we had that could actually fly, including vintage acrobatic bi-planes, a beautifully restored Ford Trimotor and of course Amelia's beloved Electra,' says Dryburgh. Image: Richard Gere, Mira Nair, Hilary Swank and and Ewan McGregor at the premiere of their film Amelia in New York. For those planes the production could not find in a flight-worthy state -- in particular the Fokker seaplane named Friendship in which Amelia first crossed the Atlantic, and the Lockheed Vega in which she set many of her records -- the production built replicas. In turn, these replicas were then flown virtually via computer animation, overseen by the film's visual effects team at Mr X in Toronto. The global landscapes that Dryburgh shot, from both above and on the ground, were largely brought to life in just one, enormously diverse country South Africa, where Nair lived for three years, and which provided the production not only with vintage art deco airports and unending skies but also the means to forge eight different countries through which Amelia traveled, without ever crossing a border. Nair was thrilled to have this chance to shoot in South Africa. The task of turning one country into several fell to production designer Stephanie Carroll, with whom Nair has repeatedly worked with since The Perez Family, one of Nair's little known films which wasn't a critical hit either. Carroll faced a daunting task ahead. Each set that Carroll created is layered with details she gleaned out of reading about Amelia's itinerant life, details chosen to further reveal the inner territory of the ever-exploring character. 'Every element you see on screen should, I believe, reflect the emotions of the script and somehow, subliminally the audience should feel it's about Amelia or about flight,' she explains. In South Africa, Carroll's work was about transformation. For example, one of her biggest challenges was turning a grassy airfield in the Transkei into the Lae airstrip in New Guinea, where Amelia was last seen before disappearing. To help recreate the Fokker F7 seaplane and Lockheed Vega, the filmmakers recruited visual consultant Paul Austerberry, who oversaw the fabrication and construction of all the vintage planes. 'Paul did a fabulous job and the film could not have happened without him,' says Carroll. Austerberry tracked down the original Dutch drawings of the F7 from the Fokker factory in Holland to match up the airframe structure and fuselage -- and drew from photographic evidence to forge the plane's 29 foot-long pontoons used for water landings. He also was able to use the wrecked fuselage of a Lockheed Vega to rebuild the plane's structure replete with its original gauges. In addition, Austerberry created an interior mock-up of Amelia's Electra that was used for some scenes in addition to the "Hazy Lily." The whole process, Austerberry says, was like a history course in how modern aviation first got off the ground. 'Amelia's life spanned the birth and development of human flight,' he notes. Walicka Maimone, who previously collaborated with Nair on the award-winning HBO hit Hysterical Blindness, began with the thousands of archival photographs of Earhart, literally lining her walls with them for months as she began her artistic process. 'I surrounded myself with these pictures and really studied and from that emerged a feeling of knowing this incredible woman intimately,' she says. In contrast to period films that sometimes suffer from a scarcity of information, Amelia deluged Walicka Maimone with real-life input. After all, the more Amelia was photographed, the more she began to forge her own image that evoked strength, capability and adventurousness, along with a dash of feminine glamour, she says. 'We had pictures of Amelia in every kind of outfit, from her flight stuff to her press conference outfits to her glamorous evening outfits and there was such a massive range,' she muses. Walicka Maimone especially enjoyed researching the history of flight uniforms, and discovering that in the 1930s there was no standard outfit for women pilots, which turned Amelia into a fashion pioneer as well. By 1934, Amelia had started Amelia Earhart Fashion Designs, with a line of clothing at Macy's. Her look was instantly recognizable -- streamlined, ready-for-action with a powerful, unfussy elegance. And that was the essence at which Walicka Maimone aimed. The designer's team ultimately created many of the film's outfits from scratch because vintage items were too fragile to withstand the intense production. In doing so, Walicka Maimone kept one eye on the authentic past and another on women's fashion of the present. 'We wanted to create a modern, relevant take on the period fashion of the 20s and 30s, which means you sometimes have to avoid the more extreme details,' she explains. Nair says that Walicka Maimone walked that razor's edge with impressive balance. Further enhancing the costume work is the work of Hilary Swank's makeup artist, Vivian Baker, and hair designer, Anne Morgan. 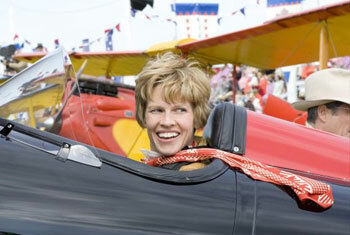 July 24, 1897: Amelia Mary Earhart is born in Atchison, Kansas. Her father is a lawyer and inventor, but also an alcoholic. Her mother is the first woman to summit Pike's Peak in Colorado. January 3, 1921: Just a few months after American women win the right to vote, Amelia starts taking flying lessons from woman pilot Neta Snook. December 15, 1921: Amelia receives her flying license. October 22, 1922: Amelia breaks the women's altitude record, rising to 14,000 feet. June 17-18, 1928: Amelia becomes the first woman to fly across the Atlantic (as a passenger) in a Fokker F7 piloted by Wilmer Stultz. Upon her return to New York, she is honored with a parade, handed the key to the city and invited to meet the United States President. October 1928: Amelia begins a series of lecture tours organized by George Putnam to promote her first book: 20 Hrs 40 Min, which establishes her as a full-fledged celebrity. August 1929: Amelia places third in the First Women's Air Derby, aka the Powder Puff Derby, in her brand new Lockheed Vega. As America falls into the tough times of the Great Depression, Amelia becomes a symbol of can-do optimism and American spirit. November 1929: Amelia helps to organize The Ninety-Nines, the first women pilots' organization. July 5, 1930: Amelia sets the women's world speed record of 181.18mph over a 3K course. February 7, 1931: George Putnam and Amelia Earhart are married in Connecticut. April 8, 1931: Amelia sets the woman's autogiro altitude record of 18,415 feet. May 20-21, 1932: Amelia becomes the first woman and second person to fly solo across the Atlantic. She receives the National Geographic Society's gold medal from President Hoover and the Distinguished Flying Cross from Congress. She writes her second book, The Fun of It, about her journey. August 24-25, 1932: Amelia sets the women's record for fastest non-stop transcontinental flight. April 1933: Amelia is invited to dinner at the White House with Franklin and Eleanor Roosevelt, and famously takes the first lady on her first-ever night flight, sparking a lasting friendship. January 1934: Amelia turns to the Pacific Ocean and becomes the first pilot to fly solo from Hawaii to California. Soon after, she debuts her own brand-name fashion line at Macy's. January 11, 1935: Amelia pioneers the first solo flight across the Pacific Ocean, between Honolulu and Oakland, and uses the first civilian plane equipped with a two-way radio. April l9-20, 1935: Amelia is the 1st person to fly solo from Los Angeles to Mexico City. June 1, 1937: Amelia and Fred Noonan take off from Miami, Florida on an around-the-world flight. After 22,000 miles of flying, Earhart and Noonan are last seen in Lae, New Guinea. July 2, en route to tiny Howland Island for refueling, the US Coast Guard cutter Itasca loses contact with Earhart and she is not heard from again. President Roosevelt orders a massive search, which is called off July 18, 1937. Two years later she is declared legally dead.